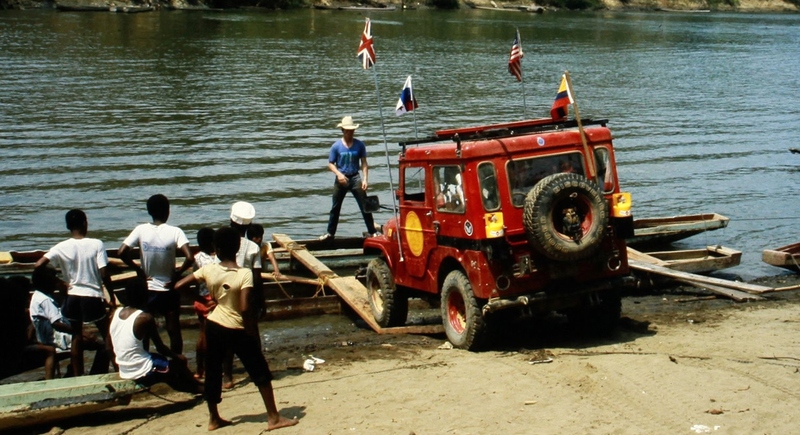 On March 4, 1987, the Sand Ship Discovery, Loren and I arrived in the small river town of Rio Sucio, Colombia, much to the delight of the local school children, many of whom had never seen a vehicle. 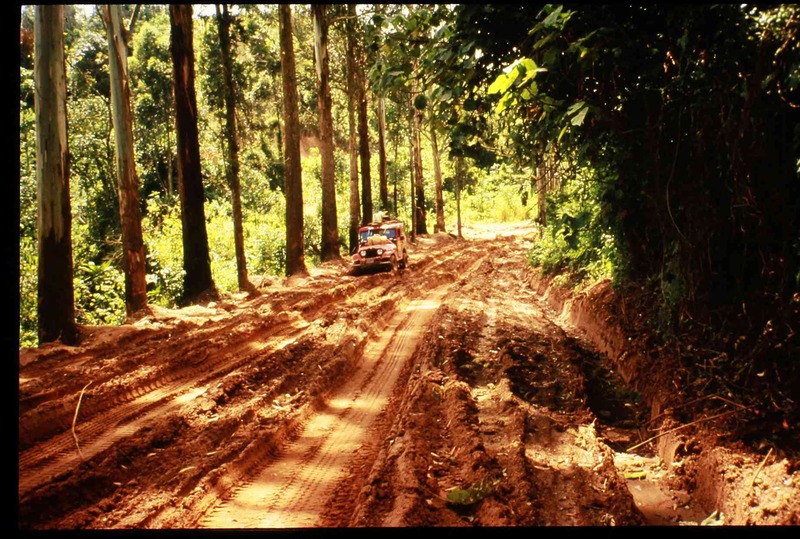 We had spent a total of 741 days to travel 125 miles, from the end of the Pan-American Highway at Yaviza, Panama to the beginning of a road system in Colombia at the town of Rio Sucio on the Atrato River, all on land. Once back on a road in Colombia we continued on south via the Pan-American Highway to the farthest road south on the South American Continent, 39 miles south of Punta Arenas, Chile. We then crossed the Straits of Magellan to the Island of Tierra del Fuego and traveled as far south as possible, just over 71 miles east and slightly south of Ushuaia, Argentina. 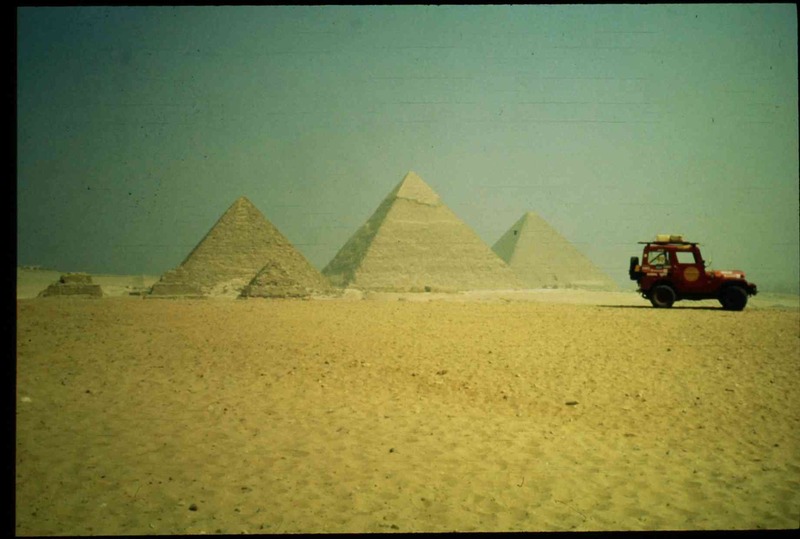 We hoped to eventually meet up with the rumored newly surfaced road in Egypt that we had heard stories about. The multitude of far-out stories one hears while traveling overland in Africa is a story in themselves. Shortly after I was released from the hospital, we were once again headed north. We left Khartoum way over loaded with food, fuel and water, the Sand Ship Discovery tipped the scales at 5900 pounds, at least 1800 pounds over-weight! From the Soviet Union we traveled into Finland and then into Norway. We found that the farthest road north was at the Sletness Lighthouse just outside of the small fishing village of Gamvik, Norway. 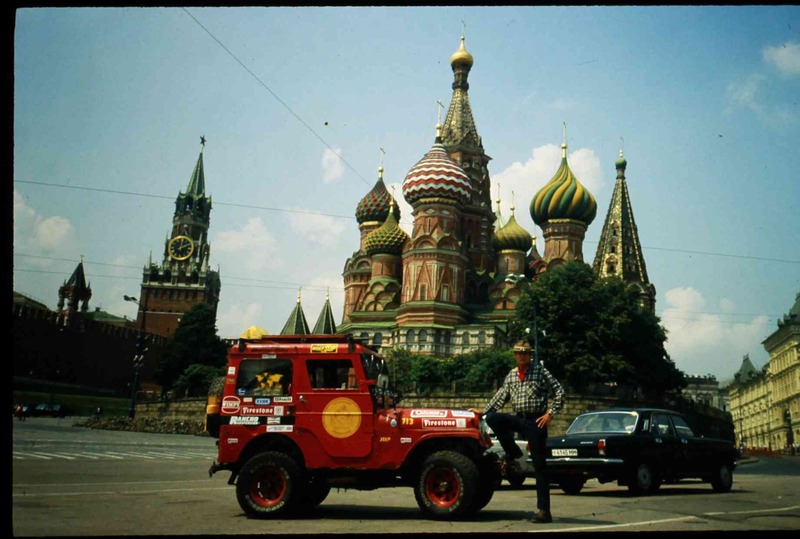 After taking one American-made vehicle around the world, we found it most fitting to officially terminate our world expedition on the Fourth of July, 1989. The Sand Ship Discovery had been out for just over five years and had clocked over 56,000 miles since her start in Prudhoe Bay, Alaska, less than 3000 miles over the North Pole. Since we had traveled to the Island of Tierra del Fuego in South America, we decided to travel to the Island of North Cape, off the northern coast of Norway. Once there we also drove as far north on the Island that we could possibly go. 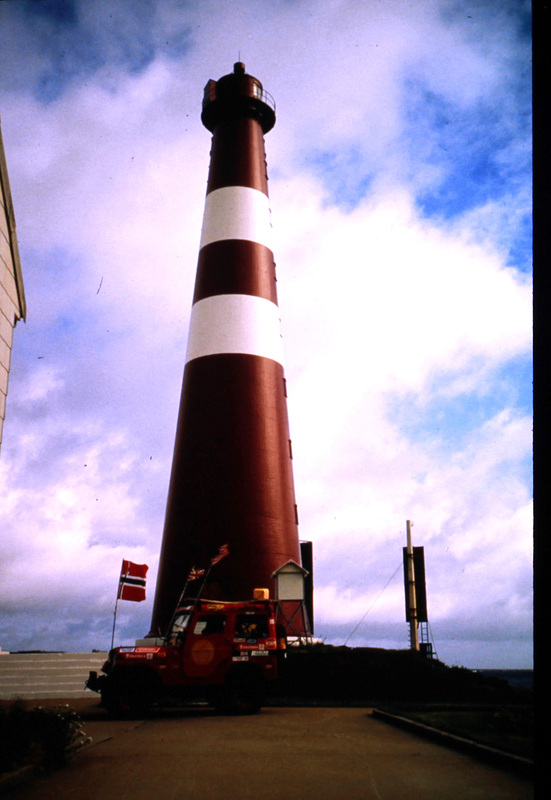 From there we traveled back to the Netherlands and shipped the Sand Ship Discovery back to the United States. In August of 1987 we were most fortunate and received free passage from the Pegasus Shipping Company on a Greek freighter, the Aran. Loren, the Sand Ship Discovery and I traveled from Chile to Cape Town, South Africa, a remarkable 30-day adventure, complete with two "force nine storms." 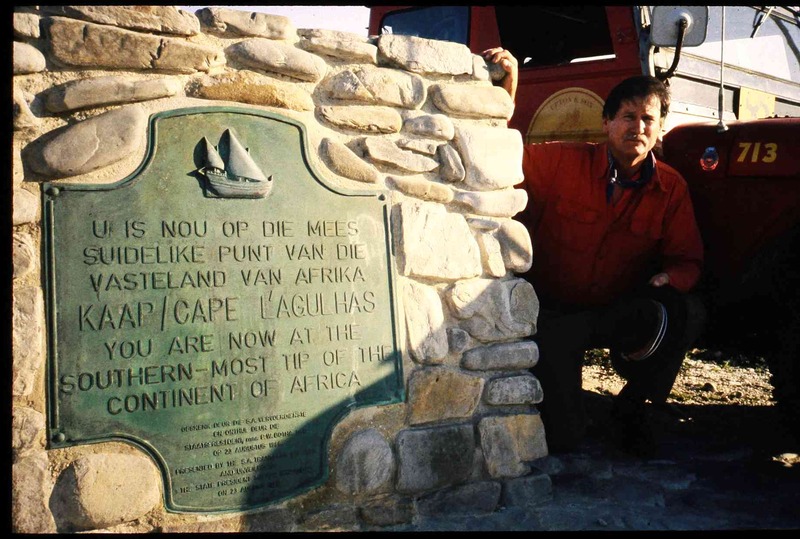 Once in Cape Town we drove further south to Cape Agulahas, the southernmost point of land and road on the African continent, and from there we began our journey northward . Loren's perseverance pays off. 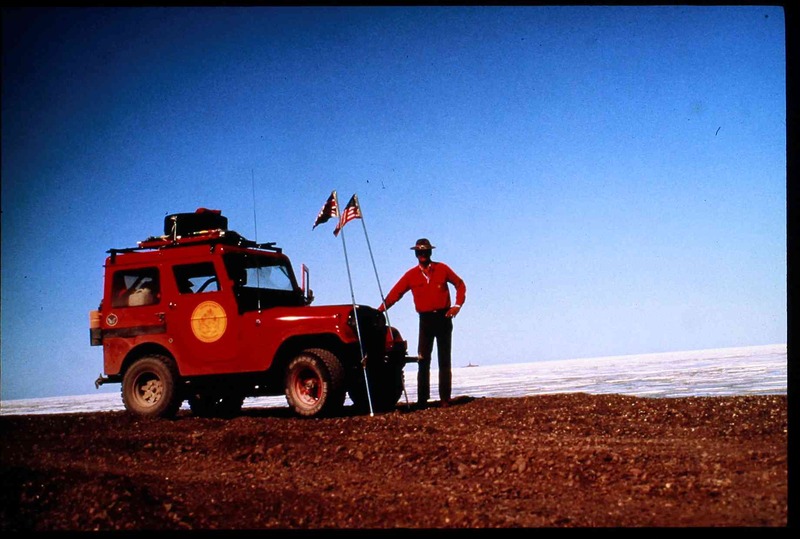 On June 15, 1984 Loren set off from Prudhoe Bay, Alaska, on the Arctic Ocean, farthest road north on the North American Continent. This time Loren was driving a second-hand 1966 CJ-5 Kaiser Corporation Jeep, christened, the Sand Ship Discovery. In October of 1984, when Loren arrived in Panama, I was ready to make that leap! 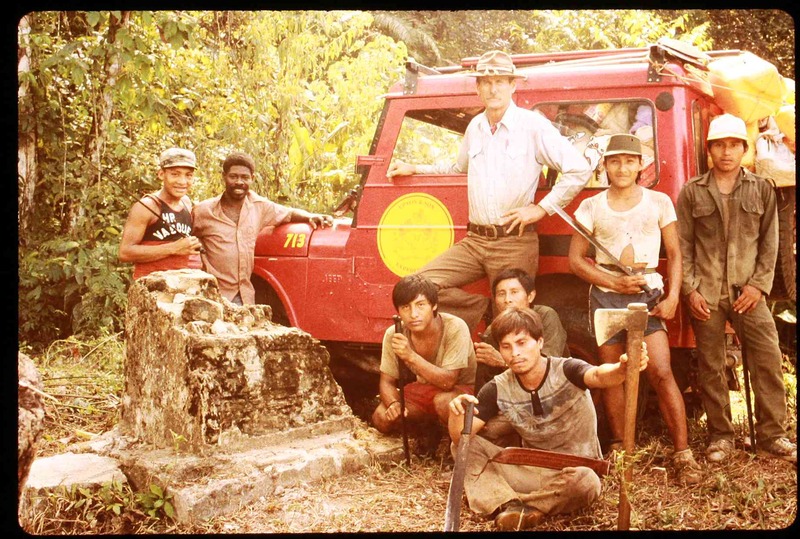 I knew that once I said I wanted to join the expedition, I had to do everything in my power to fulfill that commitment. I set off on an adventure that would change my life. 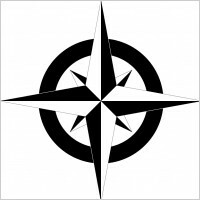 In late June (1988), the 24th to be exact, just over two weeks after I was released from the hospital, we were traveling through the open sands in an unmarked area of the southern Sahara Desert, to the west of the mighty Nile River. Temperatures were now nearing the 130 degree Fahrenheit mark; we were navigating by the sun and stars; our compass had died a most untimely death. While driving out of a most innocent looking stretch of sand, the Sand Ship Discovery snapped her right rear axle shaft. 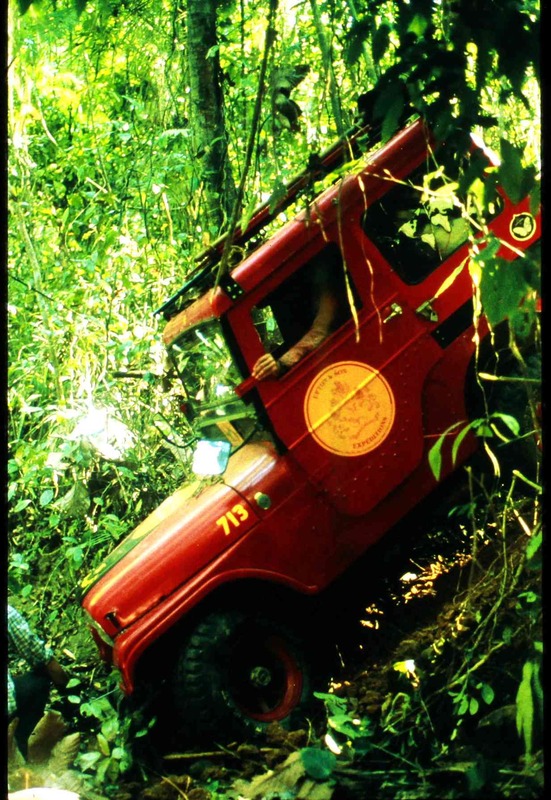 We had already used our spare thus we found ourselves face to face with a life-threatening survival situation. The last village was 90 miles back through some very rugged desert terrain; the last human was a good 45 miles back, tending a few goats; we were guessing we were about 40 miles south of the Egyptian border, and we'd seen no living creatures for over 24 hours. We had no idea how far away the Nile River, our life line, was. It was to the east of us, but how far? We had turned away from the river earlier in the day to drive around a large group of rugged mountains and had not seen the river for hours. That first night we were a bit anxious, to say the least. The questions were endless. The next morning Loren hiked up to the top of the nearby mountains and found that the Nile River was only about one mile away - a major relief. There was no sign of people, but at least we had an endless supply of water! Fortunately we were not yet on Lake Nasser and the Nile River had a good current. After several hours of work, Loren created the S.S. (Survival Ship) Nile Queen using one of the Sand Ship Discovery's tin kitchen drawers (measuring about 17 inches wide, 11 inches deep, and 30 inches long). 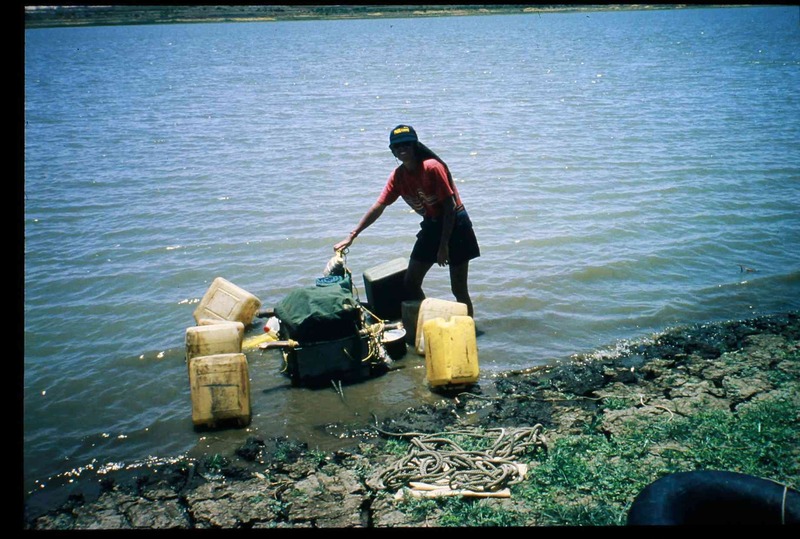 By using a little Permatex Silicon Sealant, some rope, tamarisk poles, and eight five-gallon plastic jerry cans Loren built a very "sea-worthy" craft. 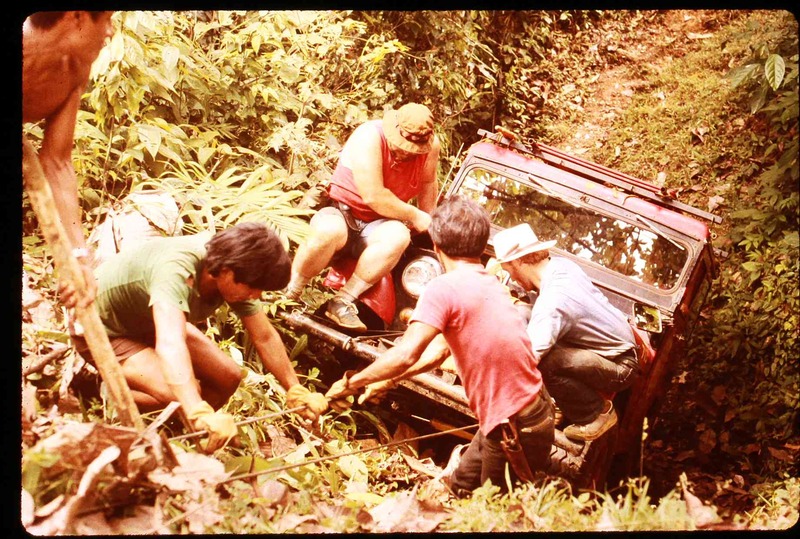 After we secured the Sand Ship Discovery in some nearby brush we loaded all of our survival gear (food, cooking pots and minimal bedding) into the jury-rigged raft. We submerged ourselves in the chilly waters of the Nile and held on to the sides of the S.S. Nile Queen, and let the current take us down the mighty river and further into the unknown. For us, the "road" to Egypt was non-existent at best. We were traveling up the west side of the Nile River in open desert, no roads only tracks and even those disappeared shortly after leaving the village of Dongola. The only road, the coastal road, along the Red Sea, was closed to vehicles because of an on-going border dispute between Sudan and Egypt. It was for this reason we found ourselves in the very remote open desert on the west side of the Nile River. 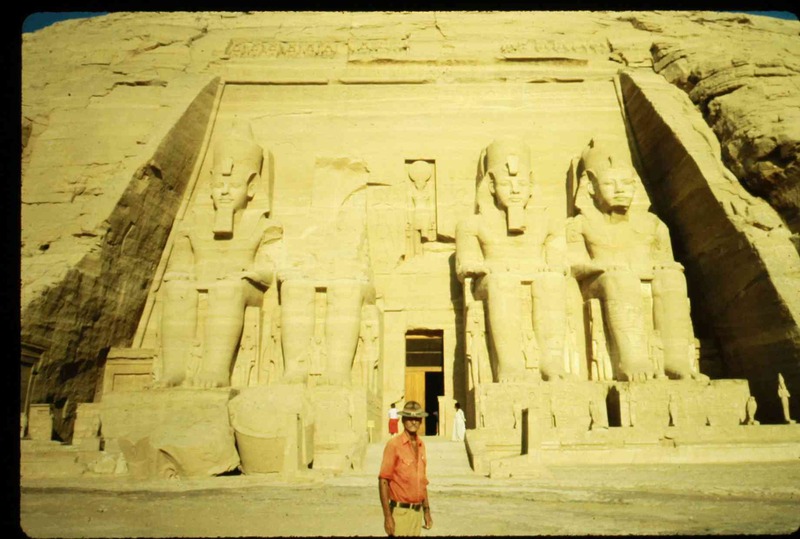 In Aswan, Luxor, and Cairo we played the role of tourist. To us, after six months of traveling in the real heart of Africa, straight up the middle, Cairo was a very modern city with just about anything we could want. To some of the tourists we talked with, who recently arrived from Europe, Cairo was a primitive city with nothing in common to their world. But isn't that why we travel to foreign countries? If it's just like "home," why go? After Cairo it was through the tunnel under the Suez Canal and into the Sinai, a truly beautiful area well worth a lengthier visit. From the Sinai it was into Israel and the Occupied West Bank. It was here that we came up against our one and only insurmountable road block. In order to remain entirely on land from Africa to Europe we had to drive through the Middle East. At the time we were there, October of 1988, the political situation was still rather delicate and we were unable to drive from Israel into Jordan. And traveling through Lebanon at that time was definitely out. We got to within one mile of the Jordanian border and had to turn back. 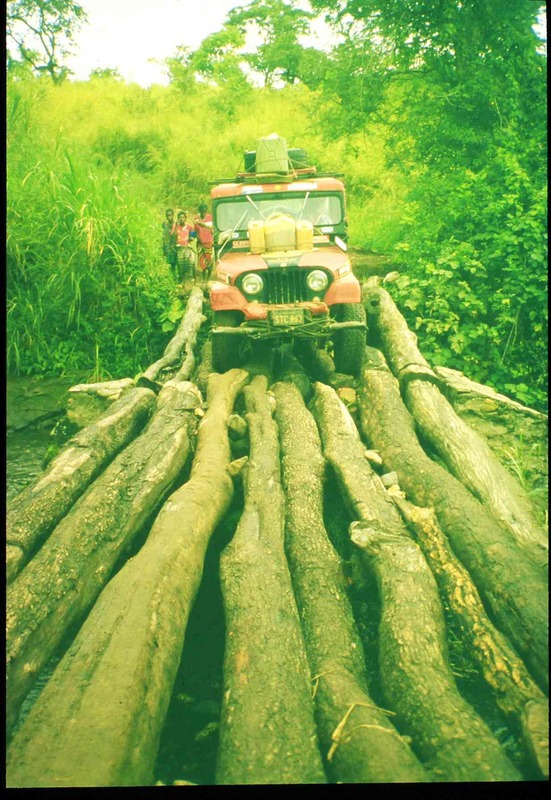 As of August 1997, there still remains a "gap" in our world circumnavigating expedition, Roads End to Roads End. One governed not by Mother Nature, as in the Darien Gap, but rather by human nature, which is, by far, less forgiving. With the current advances in the peace process it is now possible to drive from Israel to Jordan. Our plan is to hopefully drive the Sand Ship Discovery that Final Mile one day very soon. Swallowing the bitter disappointment of not being able to drive from Israel to Jordan we returned to the Sinai and took a ferry boat up the Gulf of Aqaba to Aqaba, Jordan. 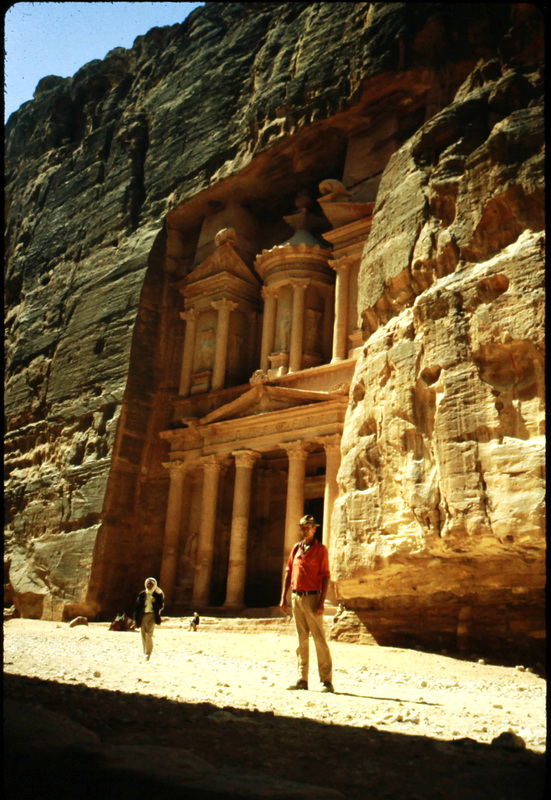 While in Jordan we visited Petra, the Rose Red City. From Jordan our route was swift through Syria and into Turkey. From Turkey we drove into the former Soviet bloc countries of Bulgaria and Romania. It was in Romania that we were to enter the Soviet Union. However, due to a glitch in the paperwork treadmill, our permission to enter the Soviet Union was not waiting for us at the Intourist Office in Bucharest as pre-arranged. It was now late October and we were told by Intourist, the official Soviet government operated tourist agency, that all camping facilities were closed for the winter. We could not afford hotels and motels, besides we certainly did not want to travel above the Arctic Circle this close to the onset of winter since all our winter clothing had been stolen out of the Sand Ship Discovery while in Khartoum - we are desert rats, not snow bunnies! We headed for England and found a wonderful welcome on a farm just outside of Canterbury in the small village of Chislet. Loren stayed with the Sand Ship Discovery while I returned to my mother's home near Seattle for the winter. 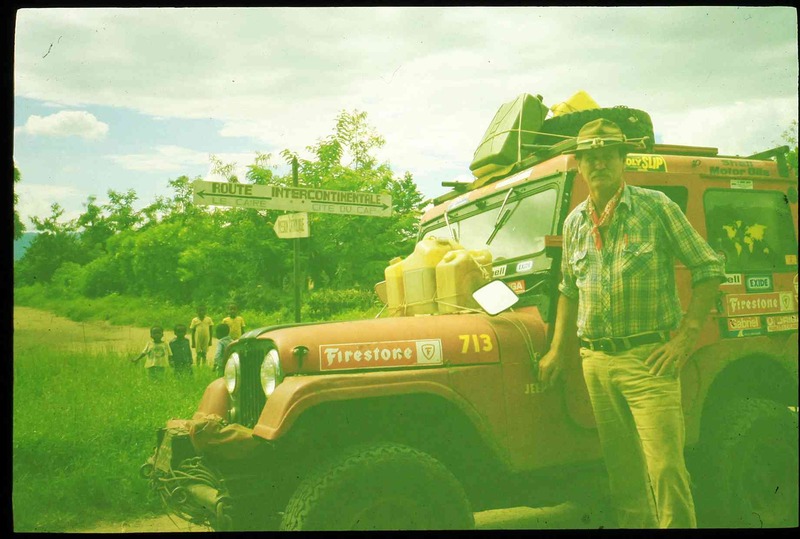 I wrote at least a hundred letters seeking sponsorship to help us finish our expedition. After four and a half years of traveling, our finances were dangerously low. American Airlines was one of the first to agree to help us with space-available air transportation. They flew me from Seattle to London and later after we completed the expedition, they flew both Loren and I from London back to the United States. When I returned to England in the spring of 1989 I had some terrific camping gear, courtesy of Coleman. We left England on the 16th of June with the Sand Ship Discovery sporting new Firestone Tires and Rancho springs and shock absorbers. Our route through Europe was uneventful until we crossed the border between what was West Germany and East Germany. The military guard at the border post was being very insistent that we pay for our visas in deutsche marks and not U.S. dollars, even though there was a sign in the window of the border post stating "U.S. dollars were OK." After going around and around on that topic for several minutes, finally the guard looked up at Loren with a big grin and said, "it's ok we are on your side." I guess it was a sign of things to come, for within a year the Berlin wall was down and Germany was reunited. We passed swiftly through East Germany and Poland. Our route then took us into the Soviet Union. Before leaving England we had visited the Intourist Office in London and we had all our paperwork in order. Everything, visas, camping sites, and motels, were all paid for before we even left England. We did have to abide by certain regulations traveling in the Soviet Union with our own vehicle, such as: no driving before daylight or after dark, we could not travel more than 500 kilometers (310 miles) a day, we had to leave our passports and visas with the "clerk" when checking into the campground or motel, and we could only travel on the "approved" roads. If there was one thing that was constant throughout our entire route through the Soviet Union, it was that we met some of the friendliest people on our entire world journey. For two and a half days we floated down the Nile River. We would get out of the river late each afternoon, looking like the proverbial prunes, and make camp, exhausted. On the morning of the third day we found people and were able to get a truck ride to the village of Wadi Halfa. There was a twice weekly train that operates sporadically between Wadi Halfa and Khartoum. Our first attempt to leave Wadi Halfa was thwarted by the local Security Police. An hour and half after leaving the train station the Security Police removed Loren and I from the train and drove us by vehicle back to Wadi Halfa. Talk about anxious moments, it was the dead of night, we were put into an unmarked vehicle by men not wearing uniforms, nor did they present badges. Were we to join the "never to be seen again" people who, from time to time disappear in these forgotten backwater places? We were deposited at our previous hotel, the Crocodile Hotel, searched and our passports were taken from us, virtually under house arrest. The following day, after much questioning by the chief of the Security Police and a great deal of "talk" we were finally allowed to leave on the next train, three days later. The "Nile Valley Express" train ride from Wadi Halfa to Khartoum was thirty very long, hot dirty hours. I believe the train cars had seen no maintenance since Lord Kitchener's day. The glass was gone from all the windows, and in fact, once the train was loaded to capacity and way beyond, the only way in or out of the train car was through the open windows. The night air was quite refreshing. However, once the sun rose, that air was anything but cool and towards the middle of the afternoon we traveled for several hours through a huge sand storm. We were literally sweating "mud" when we arrived in Khartoum. The replacement free-floating axle shafts were ordered from the United States, via a telephone call to my mother, bless her soul, and mailed to the US Embassy in care of a very understanding American official who did not mind stretching the rules a bit. 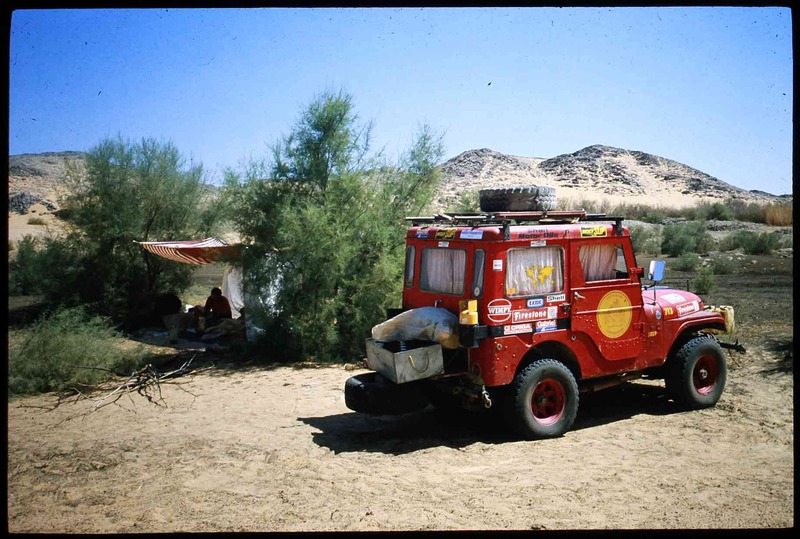 Loren was concerned about the Sand Ship Discovery being left all alone, so after purchasing a six week supply of rice, beans, oatmeal, and powdered milk, he returned to the Jeep, via Wadi Halfa to await my return. Loren's return trip was a fifty-two hour ordeal on the "flying camel" (The Nile Valley Express) that was spent on a flat car exposed to the merciless sun. He had to stand for the first 12 hours because the car was so packed with humanity. Khartoum sits at the confluence of the White Nile and the Blue Nile. Exceptionally heavy rains in the mountains of Ethiopia (source of the Blue Nile) and in the southern part of Sudan (the White Nile flows through this area); along with what little rain fell in Khartoum, produced catastrophic results. Khartoum was cut off from the rest of the country. The railroad tracks were washed away; what "roads" existed no longer did, and all domestic flights were canceled. I was stuck in Khartoum. I was sure that Loren and the Jeep were above the flood waters of the Nile, but I had no way to inform him as to the cause of my delay. I knew his food supply was dwindling, by now he'd been back at Broken Axle Camp for some 40 days. I talked to everyone I could think of, and even asked for information about camel caravans going north! After a couple of weeks of talking with charter airlines, Sudanese government officials, friends, and some of the relief agencies, I made contact with the United Nations Development Program (UNDP) in Khartoum. This organization had the monumental task of coordinating all the relief agencies' efforts. The Belgium Air Force had just loaned UNDP the use of a Lockheed C130 Hercules for transporting relief supplies to the northern villages, the ones hardest hit by the flooding Nile. The Hercules was flying to Wadi Halfa the following morning and it was arranged for me to be on board. Upon arriving in Wadi Halfa I was taken under the wing of the Shell Oil agent, Mr. Murbarak. Along with the entire village he was well aware of the situation involving the Jeep. He took me to his family home for the night and helped me arrange for a boat to take me up the swollen Nile River the following day. It was a long six hour struggle up the Nile, whose waters were the color and consistency of a thick chocolate milk shake. Loren was able to replace the broken axle shaft in fifteen minutes. 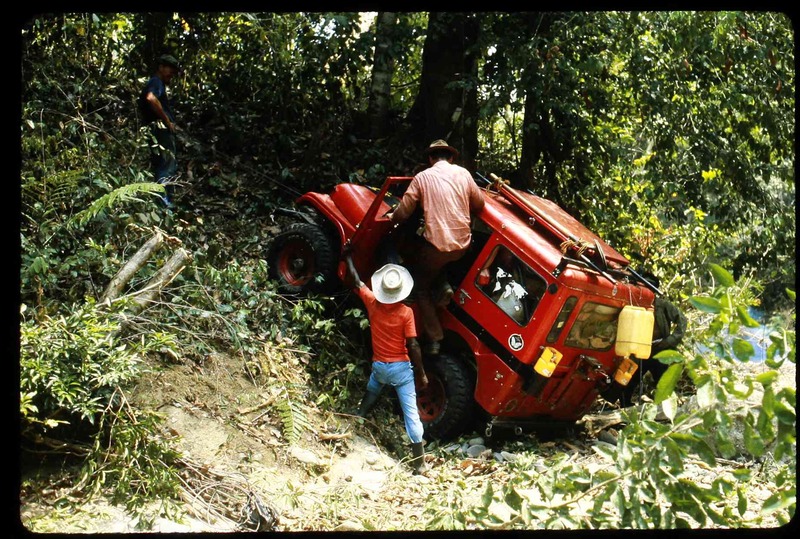 Since the axle is of the free-floating design, he did not even have to jack the Jeep up or remove the tire. For this minor, fifteen minute repair, we were "down" for a total of 70 days! Four and half hours and 36 miles after leaving Broken Axle Camp we were on the rumored tarred road in Egypt, it was a good feeling! 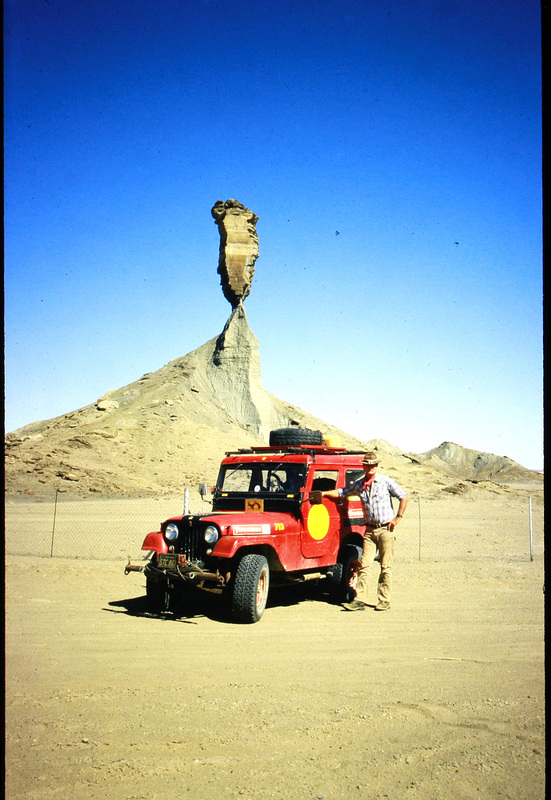 We had traveled some 8000 miles through the heart of the Dark Continent, nearly half of which was done in four wheel drive. Sudan and its 1800 miles of soft sand and insufferable summer heat reduced the Sand Ship Discovery's progress to a crawl. Erroneous readings from the engine's temperature gauge, which at the time we thought was a malfunctioning water pump, limited our travel to late evenings and early mornings. I came down with a dreadful case of malaria just before arriving in the capital city of Khartoum. We had been taking malaria prophylaxis, but our journey was taking longer than expected and we had taken our last pills a couple of weeks previous. I was running a very high fever and was unable to keep any liquids down. Day time temperatures were between 110 and 120 degrees Fahrenheit and I was extremely dehydrated by the time we arrived in Khartoum. I was immediately hospitalized and diagnosed with severe dehydration, bacterial dysentery and malaria. After pumping four liters of fluid back into my system and taking the required super dose of anti-malaria drugs, I was on the road to recovery and the Sand Ship Discovery was soon on the road to Egypt. We spent the next several months in South Africa and Namibia, known at the time as Southwest Africa. We met some wonderful families that we are still in contact with and hope one day to cross paths with them again. We experienced first-hand the devastation caused by the floods of 1987 in Natal, South Africa. We visited the Etosha Pan and the Kalahari National Park and saw, up close and personal, the most magnificent animals that Africa has to offer. We traveled to the Witwatersrand and were most fortunate to see, again up close and personal, the deep gold mines of South Africa. In March of 1988 we prepared to leave the comforts of South Africa and journey north through the so called Dark Continent. 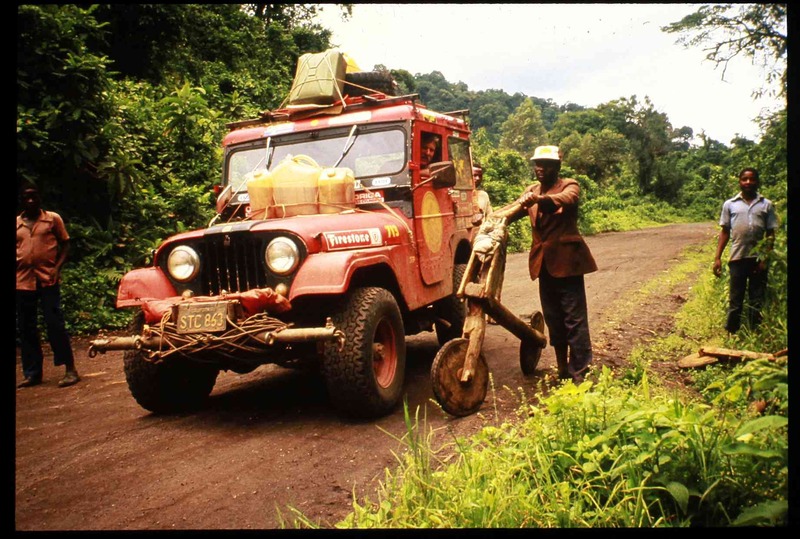 Our route through Africa was to travel north through Botswana, Zambia, Zaire, to the Central African Republic. From the Central African Republic most travelers continue through West Africa to Morocco or Algeria and take a ferry to Spain, France or Italy. Our continuing goal was to remain on land; we had to reach Egypt. The only safe option was to turn eastward in Central African Republic and head for Sudan.